Meet the Mighty Johnson Bixby SUPER SPELLERS! The Johnson Bixby SUPER SPELLERS competed in the 10th annual spelling bee fundraiser sponsored by Altrusa International of Cowlitz County, and co-sponsored by Windermere Real Estate. The competition was held at the Kelso Theater Pub the evening of Friday March 9th. Altrusa’s aim is to promote community service with an emphasis on literacy. Altrusa has chapters in 15 countries. There were 9 adult teams, and 3 high school teams competing in this year’s spelldown. 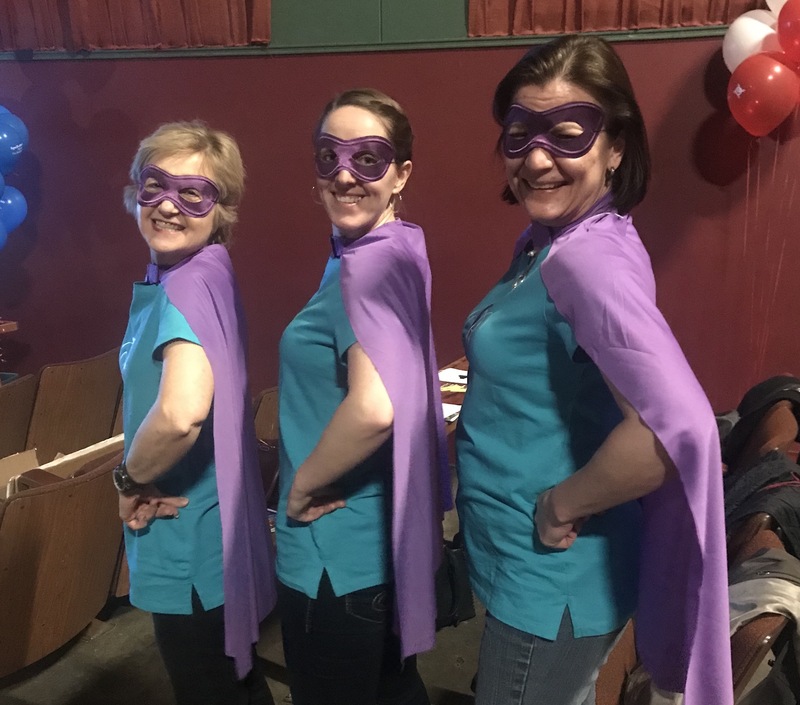 Team Johnson Bixby SUPER SPELLERS consisted of the incredible Melissa Spoharski, Jeri Boston, and Patricia Young! They were supported by their maniacal Johnson Bixby cheering squad. The SUPER SPELLERS put up a good spelling fight, yet they succumbed to the word booboisie…but who are we to judge? Their fans at Johnson Bixby still believe their super speller heroes are Wonder Women! Our caped crusaders, however, did win best team costume! It was a high energy night of fun, awesome door prizes, pizza, and beer! The winner of the adult team competed for a $500 donation to their favorite local non-profit organization. The adult team winner this year was Spellbound (representing the Emergency Support Center), and the high school team winner was Don’t Stop Bee-lieving (DSB) from Kelso High. The DSB high school team received a $500 scholarship from Altrusa, and received an additional $500 surprise match from Windermere. They also won a $150 donation which went to the American Library Foundation. Congratulations to everyone who participated! A huge thank you to Altrusa International of Cowlitz County for their dedication, service to the community, and for coordinating this fantastic fundraiser!